6 fl. oz. (177 mL). AllegroMedical.com presents The sunmark Sore Throat Spray. 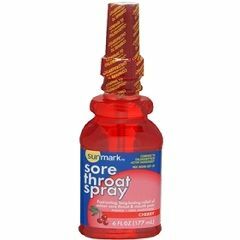 sunmark Sore Throat Spray. 6 fl. oz. (177 mL). Cherry Flavor. Active Ingredient: Phenol 1. 4%. Temporarily relieves: sore mouth, pain associated with canker sores, sore throat pain, minor irritation of the mouth and gums; pain due to minor dental procedures, dentures or orthodontic appliances. Not made with natural rubber latex. Packaged: Each.